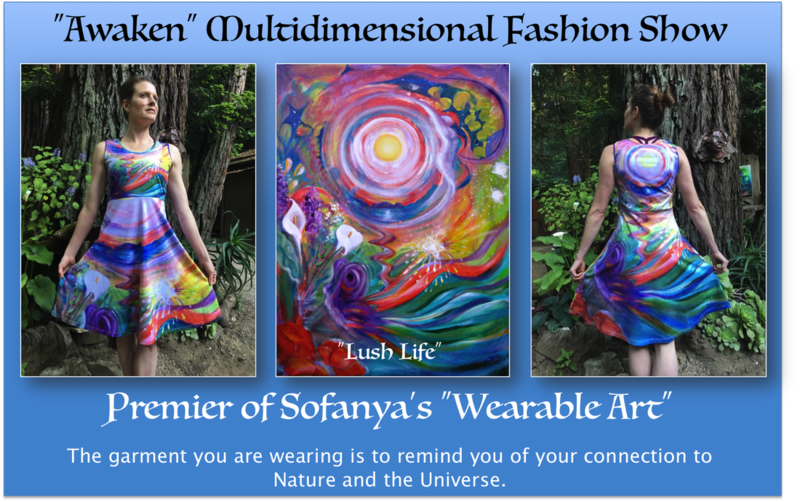 I'm so excited to offer this wearable art collection 2018! 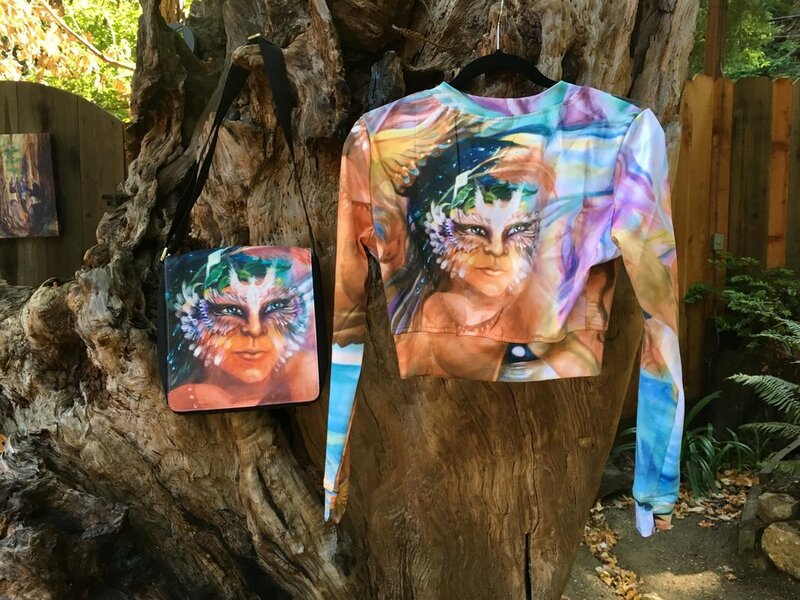 These garments and accessories have images from many of my paintings printed on them. My artwork is based on the depiction that You, that I and WE are all an integral part of Nature....in fact WE ART NATURE and everything is connected so one thing can become many. My paintings are often layered with images or have some hidden images in them. Also I am creating some original one of a kind pieces like the "Cape-Ables" and accessories like earrings and brooches. By wearing these you may feel empowered and inspired to remember who you are....a beautiful powerful Being! Please let me know if you have any questions or would like to acquire any of these items. Here you can see some of the original paintings and the garments with images from those paintings printed on them. Custom Made Hand painted or linoleum block print Wearable art designed to be worn as either a reversible cape-shawl or a cascading skirt with a hand painted button at the waist. Your unique hand painted or block printed "Cape-Able" can be made in any color or fabric that is appropriate for painting. We can discuss what kind of imagery you'd like on it or I can create a unique design and painting just for you. The cost is $350-500 depending on the cost of fabrics and complexity of painting. Call or email to explore the possibilities! 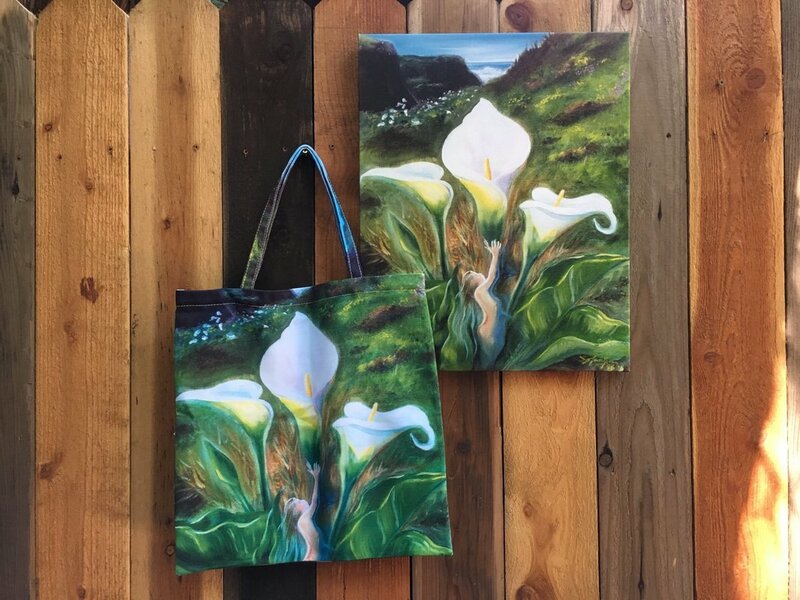 Handbags as well as totes available with this series of paintings! If you see a different painting in my art gallery page and would like it printed on any garment please let me know! Incorporating vintage jewelry, beads, plastic clays, paper and other things! Originally my brooches and other jewelry were meant as "sketches" for my large sculpture paintings. ​ It was surprising and wonderful to create goddesses in nature in powerful gestures in the universe....conveying messages of Life and Gratitude. One day I put a pin on the backs and very soon I sold my brooches to a high end boutique. From there a rep with a gorgeous showroom in LA became my agents. The boutique orders came in large quantity but I soon realized it best to continue to make them "one of a kind" pieces. If you are interested in an original unique brooch made just for you please contact me. I do not carry an inventory but I'm happy to create one just for you or a loved one.